Boston has been on my to see list since I saw the movie “Glory”. They mention the Col Shaw statue at the end but to me as an African American it has always been about the 54th Regiment of black soldiers. It sits in Boston Common, the central public park in downtown Boston. It is the oldest city park in the United States, dating back to 1634. It is a part of the Freedom Trail. To me is serves as a testament to the lives of one of the first group of African American men to serve in the Civil War. Before that Black men were not allowed to take up arms to fight, even though they participated in the Revolutionary War and the War of 1812. These men were all volunteers and they were the first documented regiment in the North. The regiment lost 74 enlisted and 3 officers in the historic attack on Fort Wagner in South Carolina in 1863. Hundreds were wounded, Col Shaw was killed during that battle. Sgt William Carney was wounded in the battled yet managed to save the regiments flag from being captured. He was the first African American to receive the Congressional Medal of Honor. Of the original regiment of 1,007 only 598 were there to take part in the final ceremonies on the Boston Common. 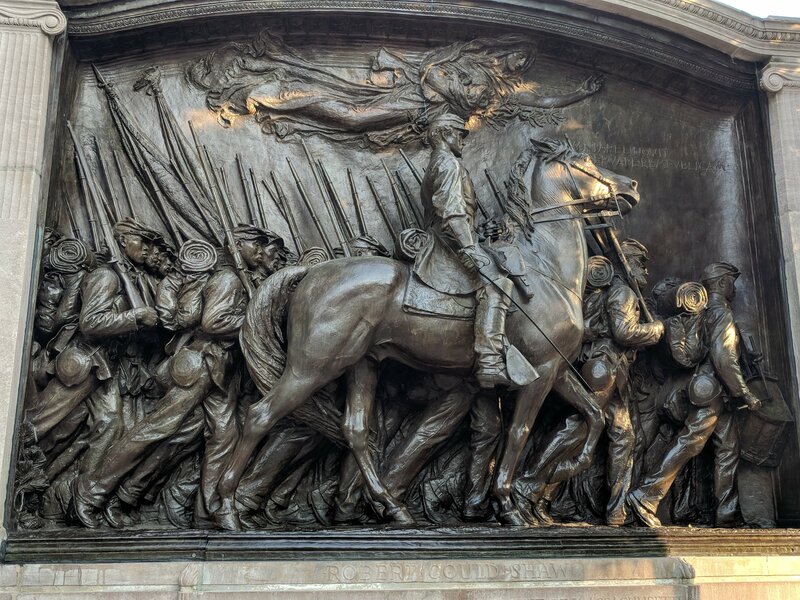 The statue shows Col Shaw and the regiment marching down Beacon Street, it was unveiled on May 31, 1897.